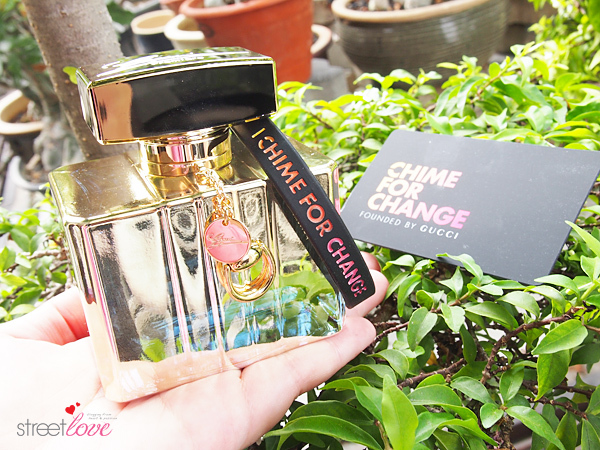 This is a continuation for Gucci’s CHIME FOR CHANGE Campaign 2014, which I blogged about middle of last month. 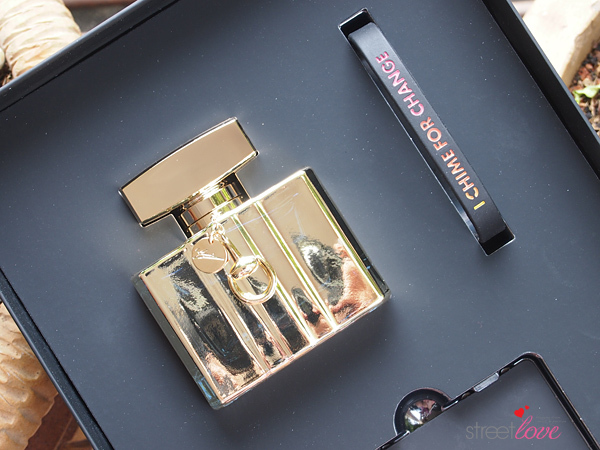 If you’ve missed out that post, do click on the link to understand more about the meaningful campaign initiated by Gucci Parfums because I’m about to unbox one interesting CHIME FOR CHANGE gift set! 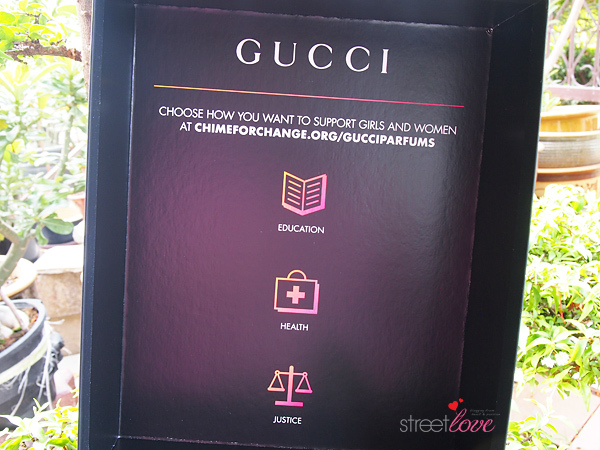 CHIME FOR CHANGE raises funds and awareness for girls’ and women’s rights globally. The campaign is co-founded by Gucci Creative Director Frida Giannini, actor Salma Hayek Pinault and singer Beyoncé Knowles-Carter, aiming to unite the voices speaking out for girls and women around the world, promoting the key pillars of Education, Health and Justice. CHIME FOR CHANGE is powered by Catapult, the first crowd-funding site where people can make real change happen for girls and women. Catapult was selected as a strategic partner to ensure transparency, accountability and measurable impact, by allowing CHIME FOR CHANGE community to choose exactly where their donations go and to track the results of their contributions on http://www.chimeforchange.org/. Gucci have selected five of their fragrances for this campaign, namely Flora by Gucci, Gucci Guilty pour Femme, Gucci Guilty, Gucci Première and Gucci Made To Measure. 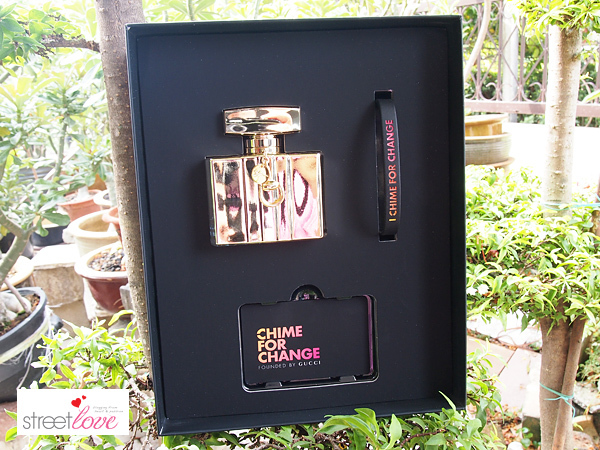 When you made a purchase of any of these fragrances’ CHIME FOR CHANGE gift set, this is what you get. 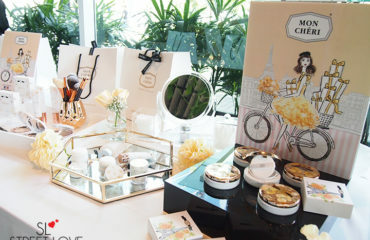 Everything is packaged in a specially made gift box. 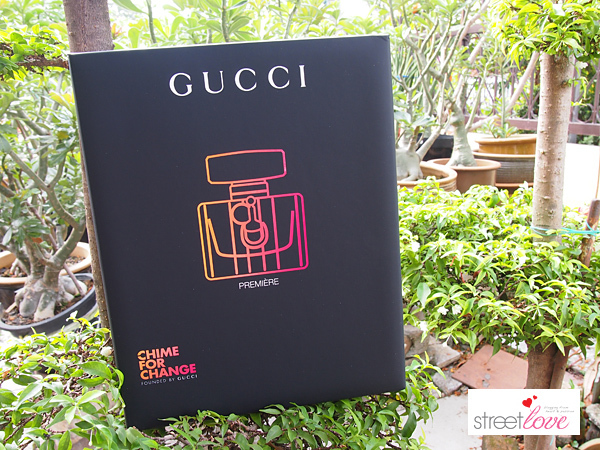 The one I have with me here is Gucci Première CHIME FOR CHANGE Gift Set. 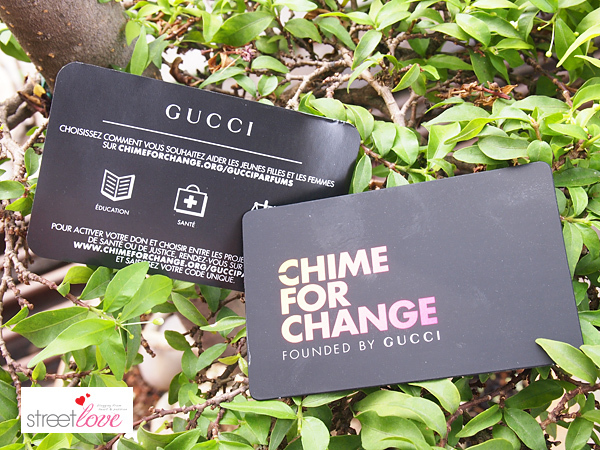 In the gift set I get a Gucci Première EDP 75ml, a customized rubber wristband with a pledge “I Chime For Change” and the most importantly, a card with unique donation code for me to go online to http://www.chimeforchange.org/gucciparfums to activate my donation and to choose whether to support Education, Health or Justice. To give a support to CHIME FOR CHANGE is very simple. 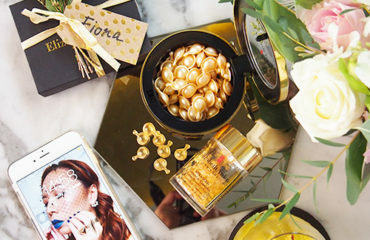 Simply just purchase any selected Gucci fragrances. 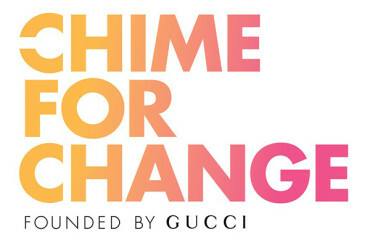 For each selected fragrance purchase, Gucci will donate to CHIME FOR CHANGE projects supporting girls and womens. 2 days of education, daily nourishment and primary healthcare for a student in Kenya. Tetanus vaccines for two pregnant mothers and their unborn children in Cambodia. Here’s a closer look to the content of the gift box. 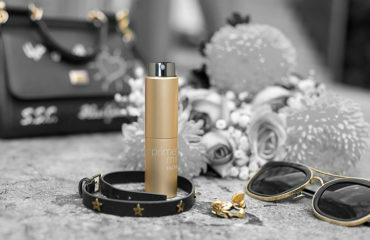 The fragrance bottle is in semi-transparent gold color, which explains all the reflection on the bottle. 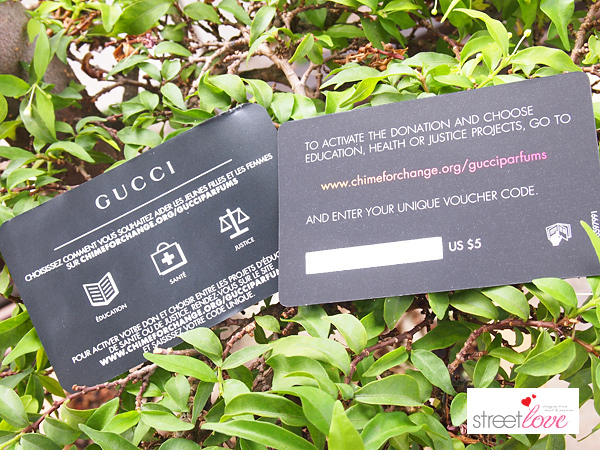 The most important item in the gift box is this card, which carry an unique donation code. 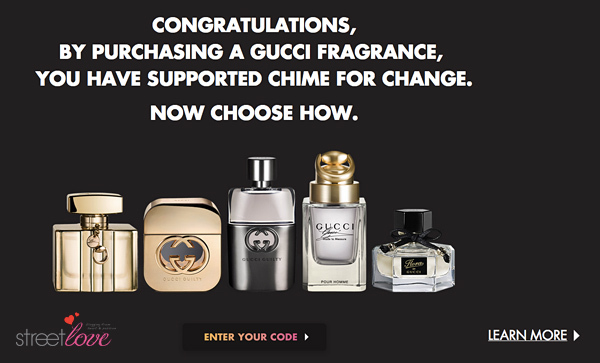 Make sure after the purchase, you go online to http://www.chimeforchange.org/gucciparfums to activate your donation and to choose whether to support Education, Health or Justice. All you need is just 2-minutes of your time. It will be meaningless if you skip this step. This is what matters! Okay so. I did mention above that it will be meaningless if I got a donation code card but I’m not doing something about it? You bet I did something about it. It’s pretty easy and it doesn’t take more than 2-minutes of my time. 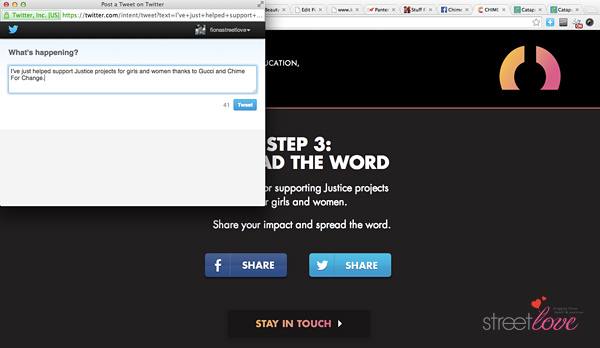 All I have to do is to go to http://www.chimeforchange.org/gucciparfums. Click on “Enter Your Code” tab. I am then redirected to Step 1 page to enter the unique donation code as stated on the card that I had. Click “Choose A Cause” tab after that. There are three projects to choose from – Education, Health or Justice. I chose Justice. 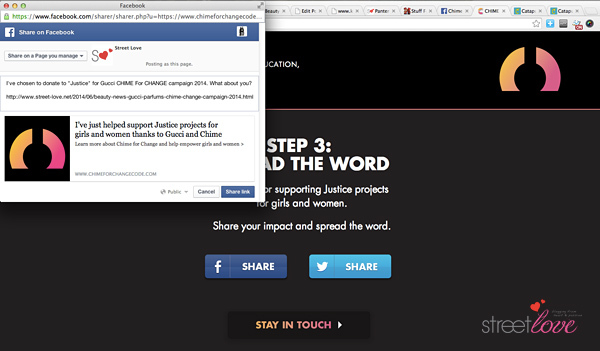 I was redirected to a page where I can see examples of the chosen project and what my donation could help with. The good thing about this campaign is that if I don’t quite like where my donation goes to, I could go back to the previous page and re-choose another project. However I’ve decided to stick with Justice as many girls and women are violated in so many different ways each day around the world. We need justice to help these girls and women! 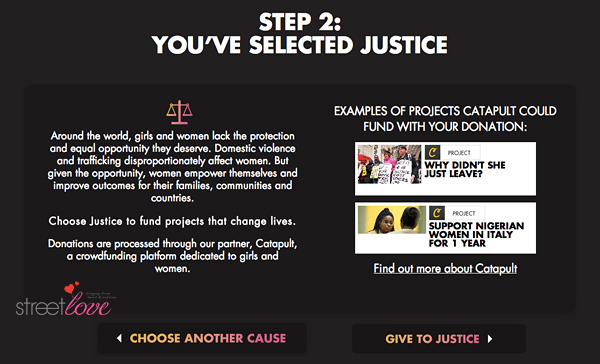 Once you are confirmed with your selection, click on “Give To Justice” tab. There’s also other ways to help spread the words around the community. Not many people are aware such campaign is taking place. I myself wasn’t aware of all this until I was approached to help spread the words. So, please do help to share onto your Facebook and Twitter platform before exiting the page. It doesn’t take much of your time, really. How often do you see fragrance company getting into meaningful campaign like this? For me I’ve not seen any before. Not only you get a special gift box, you smell good in the process, you make a pledge for a change and you are helping to improve the lives of girls and women. 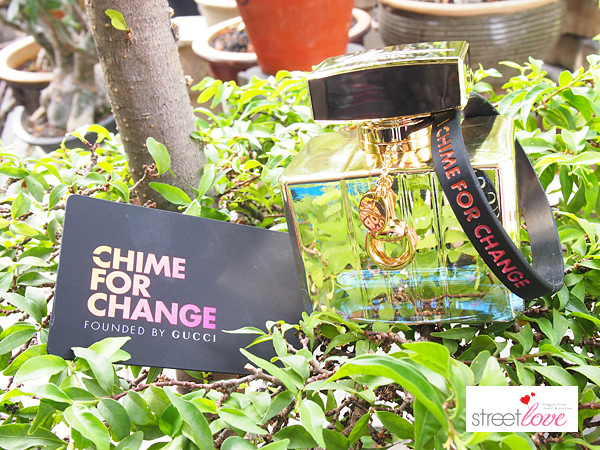 Gucci Parfums creates real change for girls and women through Gucci’s CHIME FOR CHANGE Campaign. 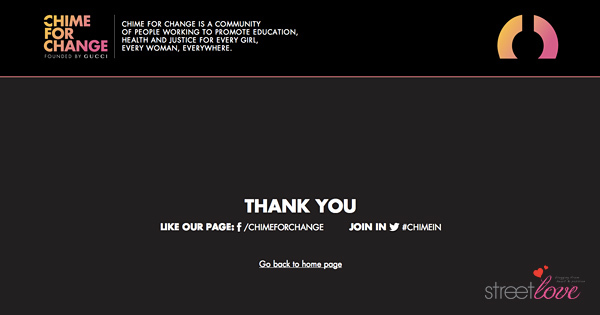 To stay informed, visit http://www.chimeforchange.org/ and join the community on Facebook at https://www.facebook.com/ChimeForChange. 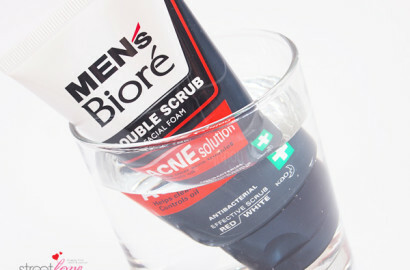 Clear photographs, campaign benefits and clear direction from you as usual. 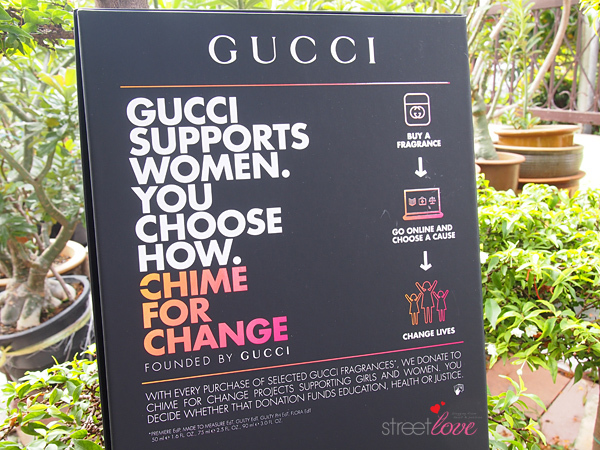 Applaud to GUCCI for initiating such a meaningful cause even though this is only the 2nd year. I like that consumer are given a choice to choose their preferred project. The part about receiving update on the supported project after 30 days is a good initiative. Thanks! 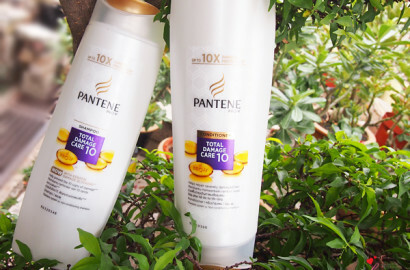 I always prefer natural lighting and green leaves. Too bad my dad cluster the garden with flower pots junk. I have to torture my mum’s plant in the process but don’t worry, nothing was harmed. If anyone is planning to get a Gucci fragrance, might as well get this. The only difference is you don’t get the original Gucci box but hey, you get whole lots more with this set. 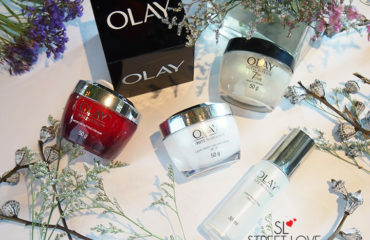 Where to get this gift set? Most departmental store that sell Gucci fragrance will have this dear. 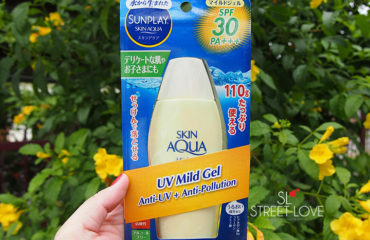 Remember to ask for this gift set instead of the normal packaging.